This is the central hub for everything related to Skip To The End, a movies podcast hosted by Ben, Mark & Gemma. 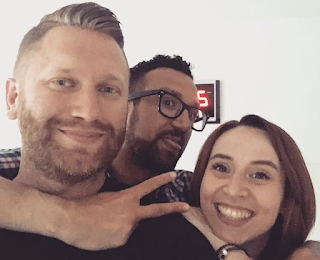 The podcast was created by Ben, Mark and Adam, but upon Adam's departure after episode fifty Gemma joined the gang. You can find us on Twitter, Facebook, Instagram and contact us by email. We love listener interaction on the podcast so please do keep in touch, and get involved in our various challenges and competitions. You can also subscribe to our podcast on Podomatic, iTunes and Spotify. Also, make sure to check out Mark's solo podcast, Mark and Me, where he interviews some big names and gets to talk in-depth about some of his favourite films.